Celebrate in style with our Great Snow Castle cake. Your little ones will be impressed by this showstopper dessert, but nobody will guess how easy it was to make! Line a 9-inch square pan with plastic wrap. Arrange cake slices on bottom and up sides of pan. Set aside. Dissolve jelly powder in boiling water, stirring for 2 min. Add ice cubes; stir until jelly is slightly thickened. Remove any unmelted ice. Add 1 cup of the whipped topping; stir with wire whisk until well blended. Refrigerate 15 min. Meanwhile, beat instant pudding and milk in large bowl. Stir in remaining whipped topping. Refrigerate. Pour jelly mixture into cake-lined pan. Cover with plastic wrap and refrigerate 4 hours or until firm. To unmold, place square serving plate on top of pan and invert. Peel off plastic wrap. Refrigerate until ready to serve. About 20 to 30 min. before serving time, spread instant pudding mixture onto dessert. 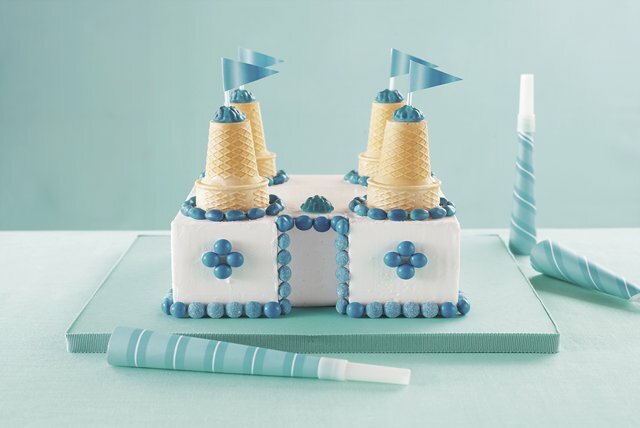 Decorate with ice cream cones and candies to resemble a castle. Cut out a piece to make a door. For easy dissolving of jelly powder, use a rubber spatula to stir and dissolve. This should take about 2 minutes. Serving Size Makes 12 servings.